At first, it seems an ordinary house in an upscale part of Boston. Lawn, white picket fence, car out front, front door opened just a crack. . .
An open-and shut-case Detective DD Warren thinks when she arrives at the house, particularly as when she last saw the suspect Evie she had just shot her own father. Killer or victim? Detective DD Warren must race to find out what has really been going on behind closed doors. 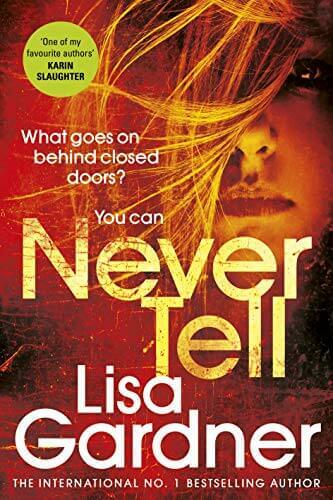 . .
"Never Tell is raw, visceral, emotional, the sentences come at you like MP5 rounds, and features three incredible characters, D.D., Flora and Evie, who, alone, could carry any narrative. Together, they create a tsunami of a thriller. This may well be Gardner’s best work, and that is saying something." "Lisa Gardner has outdone herself with this powerful novel about three women, two murders, and uncountable secrets! From its stunning opening to its last thrilling page, Never Tell will captivate, surprise, and satisfy you." "Never Tell shocks the system like ten thousand volts. D.D. Warren’s most gripping case yet. Brace yourself, gulp down a deep breath, and dive in." "This novel is on fire! Surprising twists and a great cast make this a brilliant page-turner that I can recommend to everyone." "I love a good book, especially one that grips and pulls me in and Never Tell did just that. . . I haven’t read any Lisa Gardner books before but she is now a firm favourite"
"Characterisation is superb. . .this was one very good read"
"The characters are realistic, well-developed and engaging, the plot is gripping, compelling, and full of twists, and the author addresses themes that make for a thought-provoking and sometimes disturbing read."